Sermon for Epiphany 3: "Today"
In Luke’s Gospel, wherever you find Jesus, you find God’s Word. When the magi came to Jerusalem to find the King of the Jews, God’s Word led them to Bethlehem, to the Word made flesh for us. At the age of 12 Mary and Joseph found Jesus in the temple studying the Scriptures with the rabbis, listening to God’s Word and asking questions. In the wilderness as Jesus rebukes Satan’s temptations by quoting God’s Word. Wherever you find Jesus, you find God’s Word. And wherever God’s Word is, there Jesus finds you. So it’s no surprise that when Jesus visits the synagogue in his hometown of Nazareth we find him reading and proclaiming God’s Word. We hear this story often enough that it’s easy to forget that what happened in Nazareth that Sabbath day is truly remarkable. The One foretold by Isaiah fulfills all the prophets’ words. Jesus, the Word made flesh reads his own words.Jesus reveals himself as the prophet who not only speaks God’s Word but is God’s Word, who reveals himself as Savior for you, restores our fallen creation, and is rejected on the cross for you. 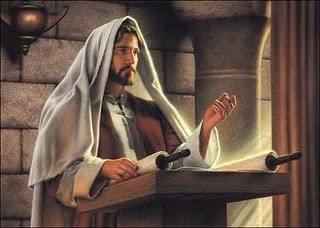 Jesus’ preaching reveals that he is the anointed one, the chosen One, the long expected Messiah. He comes to deliver Good News to us. To restore us and his fallen creation. To set us free from sin and death. For Jesus’ Word not only reveals who he is, but who we are as well. We are the poor in need of Good News. We are the blind in need of eyes to see and ears to hear our Lord. We are slaves oppressed and held captive to by sin, death, and the devil. What a difference our word is from Jesus’ words. With our words we slander, lie, curse our friends, loved ones, fellow Christians, people we don’t even know; we gossip, lash out, and always try to get the last word in. We use our words to serve, glorify, and point to ourselves. Like the people in Nazareth we often look for God apart from Jesus’ Words. We reject Jesus’ Word for our own words. But not Jesus. Jesus’ Word proclaims his suffering and dying for you. Jesus Word heals you. Rescues you. Sets you free. Delivers God’s grace and favor in Christ who was rejected for you. Luke summarizes everything Jesus does and says in that one word, “Today”. Jesus proclaims his word of revelation and restoration to us as he did the shepherds:For unto you is born this day – today - in the city of David a Savior, who is Christ the Lord. Jesus word rescues and frees us as he did the thief on the cross, Today you will be with me in paradise. Jesus finds you in the word and water of your Baptism. Jesus finds you in his Word of Absolution that pronounces liberty to us who were captive to sin: “I forgive you all your sins in the Name of the Father and of the Son and of the Holy Spirit. Jesus finds you in the Word that fills bread and wine with Jesus’ body and blood given for us. That’s why Beautiful Savior Lutheran Church and Preschool exist: by God’s Word and for God’s Word. That’s our calling, our vocation. We are to be hearers Word, receivers of the Word, and then speakers of God’s Word. We’re sent to our homes and neighborhoods, our family gatherings, parks, practice, and parties. Jesus’ Word is our life as a congregation too. This is why our life of Christian stewardship is important. It’s about more than money; it’s about supporting the work of God’s Word. This is why we show mercy to others in their physical and spiritual needs, because God has shown mercy to us; and by showing mercy to others we reveal that we have heard his word. This is why we sing, rejoice, give thanks, and praise as we gather around God’s Word together. This is why we have Sunday School, Bible class, and preschool: to give, proclaim, and teach God’s Word of life to our children. Wherever you find Jesus, you find God’s Word. And wherever God’s Word is, there Jesus finds you. It’s as true today as it was in Nazareth. Today this Scripture is fulfilled in your hearing. Today, Jesus is with us in His Word. Sermon for Epiphany 2: "All Signs Lead to the Cross"
Driving down Milton Way before or after school you see a flashing light and a sign. School zone. 20 mph. On the road to Mt. Rainier you’ll see several signs: viewpoint ahead, 2 miles. Or when your child or grandchild is dancing in line at Target, you look for signs for the bathroom. Signs give us information. They draw our attention, though never to the sign itself. Think about how absurd it would be to get out of the car and take a picture by a sign that says “Mt. St. Helens visitor’s center 15 miles”…and then load up the car and head home. Signs point us to something greater than ourselves: safety, a majestic view, relief. Signs lead us to a destination, a terminus, a fulfillment. In his Gospel, “sign” is John’s go-to word for Jesus’ miracles. Jesus heals the sick- it’s a sign. Jesus walks on water - it’s a sign. Jesus feeds the 5000 - it’s a sign. Jesus gives sight to the blind, makes the lame walk, raises Lazarus from the dead— they’re all signs. Like the signs we see every day, Jesus’ signs give us information too. They reveal Jesus to be true God in human flesh for you. But they do more. Jesus’ signs point us to something, and someone, greater than ourselves…to the greatest of all signs: his death and resurrection for us. Jesus’ signs leads us to the destination of his journey to save us, to the cross. Jesus’ signs, as John declares at the end of his Gospel, lead us to Jesus himself. The same is true as Jesus changes water into wine. This, the first of his signs, Jesus did at Cana in Galilee, and manifested his glory. And his disciples believed in him. In one verse, John tells us everything we need to know about this sign, and more importantly, about the one to whom the sign points: Jesus crucified and risen for you. This entire story is full of signs, all pointing us to Jesus’ greatest sign of all, his dying and rising for you. Jesus’ presence at this wedding in Cana is a sign. For in the words of the Isaiah, Amos, Hosea, and the prophets, the Lord is the bridegroom; Israel his bride. And even though Israel was a faithless, adulterous bride, the Lord promises to send his Messiah to cleanse her. Make her holy and blameless. for the Lord delights in you… and as the bridegroom rejoices over the bride, so shall your God rejoice over you. Same is true for us, God’s bridegroom, the church. Though our sins are as scarlet, Jesus our bridegroom makes them white as snow. Though we are unfaithful, Jesus is faithful for us. So it’s no coincidence that Jesus performs his first sign at a wedding. Jesus, the heavenly Bridegroom has come to rescue, redeem, and restore us, his holy bride and holy people. Is Jesus being snippy or rude? No. It’s neither a harsh rebuke, nor a pejorative, but a redirection, a sign pointing to Jesus’ words. “My hour has not yet come.” The next time Jesus addresses Mary this way is at the foot of the cross where he entrusts her to John’s care. “Woman, behold thy son.”That’s his hour. There’s his great glory. His death on the cross for Mary, for you, and for all. In some way, Mary understands this. Do whatever he tells you, she tells the servants. These are words of faith. Though she doesn’t know how, she knows that someway, somehow Jesus will make things right. All signs lead to the cross. The healing of the sick points to his crucifixion where he bears our diseases, griefs, and sorrows. The feeding the 5000 points to Jesus, the Bread of Life, who gives his flesh for the life of the world. The water poured into those 6 stone jars turns into wine and points us to the blood of Christ poured out on the cross for you. The 6 stone jars are a sign as well. There are 6, one short of 7 the number of completion, fulfillment. Jesus has the servants “fill them to the brim” just as he will fulfill the entire Law, every drop of it for you. The Law we break. The Law that condemns us. The Law that demands purification as it did for Israel - Jesus fills it with his perfect life and his sacrificial death that purifies us, cleanses us from all sin. And this, like the wine at the wedding, is entirely undeserved. Unmerited. Unexpected. In the Old Testament, wine is a gift of God that gladdens the hearts of men. Isaiah proclaims that on the mountain of the Lord he will prepare a meal of rich food and fine wine. Amos declares that when the Messiah comes the hills will drip with wine. When Jesus comes, he comes graciously. Abundantly. More than we desire or deserve. It’s unexpected. Undeserved. Unmerited. Just like the sign to which Cana points – the cross. You have kept the good wine until now.” The best for last. God has reserved the best for last, pouring out the finest vintage at the end. Every sign at Cana points to the greatest of all signs. God’s vintage wine is Jesus Himself, poured out for the life of the world in His death, in the water and the blood that came from His side that fills the baptismal font with washing water and fills the chalice with wine from heaven. In our everyday life, signs come in all shapes and sizes: arrows, octagons, and rectangles. Jesus’ signs have a shape too. All signs lead to the cross. To Jesus crucified for you. Sermon for the Baptism of Our Lord: "Jordan River Gift Exchange"
No matter our age, we love receiving gifts. There’s nothing quite like a gift exchange to awaken the kid at heart, even for the toughest or gruffest among us. The mystery of the wrapped gift before you. Watching the gift you want get passed: left-right-left-right…no not left again! Wondering who drew your name in the family gift exchange. If Christmas celebrates the Father’s giving of the gift of Christ Jesus to us sinners, then Epiphany is the unwrapping of God’s gift for us in his beloved Son. So it is with Jesus’ Baptism in the Jordan River. It may have looked just like every other river, full of plain, ordinary water. But there was something truly extraordinary happening in that ordinary water. Jesus comes to the Jordan River. The place where Joshua and Israel crossed into the promised land. The place where Namaan was washed of his leprosy. The place where John preaches: behold the Lamb of God who takes away the sin of the world. Here in Jesus’ baptism in the Jordan River is God’s gift exchange with us. And it’s the greatest of all gift exchanges. For it is entirely unexpected and surprising. The Christ, the Savior, the long-expected Messiah foretold by Isaiah and the prophets, the very Son of God in human flesh, stands in line with sinners to receive a sinner’s baptism. Jesus has no sin and yet willingly, lovingly, and graciously takes his place among sinners. To see how mind-boggling, and yet marvelous this gift exchange is, we must see it from John’s point of view. John beholds the One who is to judge the world with unquenchable fire, to lay the axe to the root of the tree, and carry the winnowing fork of judgment. And yet, Jesus comes empty handed to make God’s gift exchange with all humanity. No fire. No axe. No winnowing fork. Open hands that will be defiled by our sin. Open hands that will bear the nails for us. Open hands that will take all that has gone wrong with us – all our sin – and in exchange, give us his perfect life. His death for us. His Word. Promise. Body and blood. Jesus stands in the Jordan River as the Son of Mary and the Son of God ,true God and true Man for you born, baptized, crucified, and risen for you. Jesus stands in the Jordan River as the Father declares: “This is my beloved Son, with whom I am well-pleased”so that the Father is well-pleased with you through His Son. Jesus stands in the Jordan River and heaven is opened for you. Jesus stands in the Jordan River as he will stand upon the cross – in solidarity with us. As a substitute for us. As God’s great, gracious gift exchange for us. A gift exchange that is yours in Holy Baptism. As St. Paul proclaims: We were buried therefore with him by baptism into death, in order that, just as Christ was raised from the dead by the glory of the Father, we too might walk in newness of life.For if we have been united with him in a death like his, we shall certainly be united with him in a resurrection like his. You see, there’s a grand, gracious gift exchange in our baptism too. Plain, ordinary water yet God gives us his extraordinary forgiveness in this gift. Jesus takes our sin and death, and in exchange, gives us everything He did in his Baptism, crucifixion, and resurrection as he gives you his gifts of water, word, and the Holy Spirit. Baptism makes us God’s chosen, beloved, holy, children. We are not some random, meaningless, hopeless, bunch of atoms bouncing around in space, but a chosen, holy people, loved by God. Like Andy would inscribe his name upon his toys in Disney’s Toy Story, marking them as special, we are God’s great possession, and we have something greater written upon us by water and word, the saving name of Jesus. Jesus, our greater Joshua ,who leads us into the promised land through the Jordan River of our Baptism. Jesus, our greater Elisha, who washes all of us Naamans in the cleansing waters of the font. The Lamb of God who takes away the sin of the world. Jesus, God’s great gift exchange for us. The Sinless for us sinners. The Holy One for us unholy. The Righteous for the unrighteous. The Son of God for us sons of Adam and daughters of Eve. Sermon for 1st Sunday after Christmas: "Always Christmas"
In The Lion, the Witch, and the Wardrobe, C.S. Lewis tells the reader that in Narnia it was “Always winter and never Christmas.” These days in the Christmas season sometimes feel like that in our world. Everything is labeled “after-Christmas”. The music fades. Unwanted presents are returned. Christmas comes down and the New Year’s signs go up. But here in Christ’s Church, Christmas continues, a bit like our family holiday schedules: a few hours one evening with Mary and Joseph in Bethlehem – everyone has to see the baby! The obligatory time with your gruff, oddly dressed uncles, the Shepherds. Next weekend the Magi’s visit; because even God’s family table has room for outsiders. Christmas continues today with Simeon and Anna. Anna leaves the temple like grandma scurrying about the delivery room, phone in one hand, camera in the other: did you hear the good news? It’s a baby boy…and he’s the Messiah! The wait is finally over. Simeon was waiting… Not twiddling-his-thumbs or yawning away the hours, but the kind of waiting that knows that, sooner or later, God will make good on his promise. And this was the Lord’s promise: before he saw death, he would see the Lord’s Christ. The Seed that Adam longed to see sprout. The Rest Noah longed for. The everlasting on David’s throne. The child born of a Virgin whom Isaiah prophesied. This One, Simeon cradled in his arms. The Lord had heard Simeon’s cry for rescue. And already at 40 days old, your pleas for mercy, your cries of distress at sin’s torture and the prayers of the faithful – “Come quickly, Lord Jesus” – fill the ears of the child held in Simeon’s arms. God’s promise fulfilled. The Christ had come. No more waiting. Simeon was free to die in peace. Yes, there is marvelous joy in Simeon’s words. And yet Simeon knew that waiting comes before fulfillment…falling comes before rising. That Jesus’ cross is at the heart of Christmas. Simeon wields God’s two-edged sword, skillfully piercing our hearts, slashing away everything that stands between you and Christ. For we must be like Simeon, ready to die. It’s the only way to depart in peace. Drop the charade of self-devotion and self-righteousness. For you cannot cling to sin and expect to stand with Simeon holding the Christ in your arms. Fall, that you might rise. Die that you might live. At first, Simeon’s words don’t sound very Christmasy. We’d rather pack him and his words up and send him out to the curb along with all the Christmas clutter. But as the world tries to forget Christmas, Simeon comes along to remind us that hidden under that weak and helpless baby in his arms was the truth about Christmas: this Child was born to fall and rise for you. And that’s precisely what Jesus is doing in the temple that day for Simeon and you. He came to bear the cross for you. His name is Jesus, for he will save his people from their sins. He sheds his blood at 8 day old, bearing the Law in his flesh. At 40 days old the Firstborn who needs no redemption comes to redeem you. The Lord of all becomes the Servant of all. The Law giver becomes the Law bearer. Jesus does what you cannot and will not do, crawls under the Law’s demands and curse in order to lift them off your shoulders and onto his. And all while being held in the arms of Simeon. And where the world only sees a powerless infant, Simeon holds the power of God hidden in human flesh. He came this way for you as an infant and he goes this way for you to the cross. Here, in God’s lowly, weak and beggarly ways…he hides his love and mercy for you. Behold, this child is appointed for the falling and rising of many – for Simeon and for you. Christ falls in order to raise you up. For all that we have spoken against…he speaks for us. For all of the sinful thoughts of our heart revealed by his Word, Jesus reveals God’s heart of mercy and peace and redeeming love. The sword that pierces Mary’s soul and ours first pierced Jesus with nails and spear. Christ departs in shame and guilt and sin so that we depart in peace made by his blood. Jesus’ eyes are closed by bloody, sweaty death so that our eyes are opened to find salvation in this Child and his cross. Jesus is held in the arms of the cross in the darkness in order to embrace you and all nations in the everlasting light of Christ’s salvation. Jesus becomes the despised, scorned and rejected in order to make you a people of his Father’s glory. This is the way God works. He hides himself in the opposite. The eternal God is hidden within the flesh of an ordinary, helpless baby. Simeon embraced the Savior of the world who came to embrace his death and bring salvation to all, to you. God’s greatest glory is found hidden in the weakness and suffering of the cross. And Jesus works the same today: Ordinary words of sinful preachers are vehicles for Christ’s eternal absolution. Ordinary water is blessed flood and a lavish washing away of sin. Ordinary bread and wine hide the flesh and blood of Jesus your Savior. That’s why we sing Simeon’s song after communion. Here, you stand on heaven’s threshold and hold the Christ Child in your arms, in your ears and in your mouth. At the Altar you see the Lord's salvation, which He has prepared before the face of all people. Here in Christ’s Church, Christmas isn’t packed away and saved for next year. There are no such things as “after-Christmas” sales in Christ’s Church. Here at Christ’s table, in His Supper, it’s always Christmas. In a way, we’re all 21st century Simeons and Annas in the temple, watching, waiting for that Day when Christ’s salvation becomes visible to our resurrected eyes. And as we wait, God gives us his signs to cling to - Baptism, His Word, His Body and Blood. We embrace Him as old Simeon and Anna once did. And we take up Simeon's song and make it our own: "Lord now let your servant depart in peace according to your Word. For my eyes have seen your salvation, which you have prepared in the sight of all people. A Light for revelation to the Gentiles, the Glory of your people Israel."